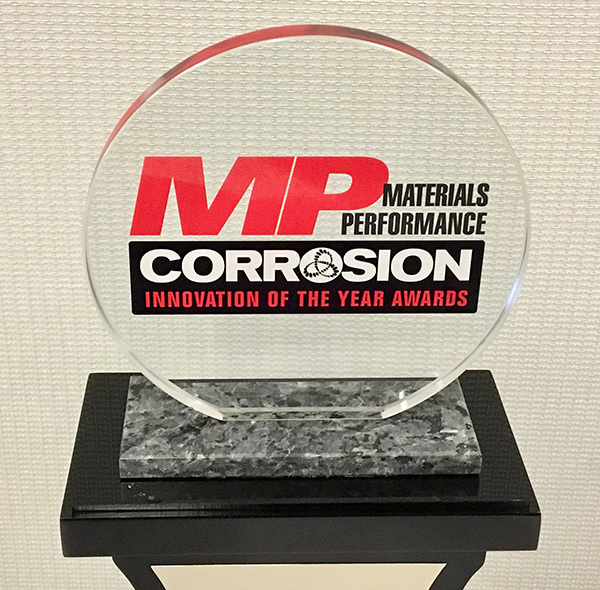 Materials Performance (MP) Magazine honored the new class of winners for the 2019 MP Corrosion Innovation of the Year Awards program in Monday’s ceremony at CORROSION 2019 in Nashville. The ceremony was held immediately outside the Exhibit Hall entrance, just minutes before the hall opened. The complete list of finalists is available at the event web site, along with full descriptions of each innovation. The 10 winners were first announced publicly by current NACE President Jeff Didas at the afternoon ceremony, where each winning group also received a trophy to commemorate their success. The MP Corrosion Innovation of the Year Awards program provides a forum for NACE International members and customers to showcase their corrosion mitigation technologies and receive recognition for their innovative solutions. Winners were selected by a panel of corrosion-control experts spanning a diverse range of subject matter expertise from across the industry. In all, the global corrosion control community submitted more than 50 nominations for the 2019 program,setting an all-time record. To be considered an innovation, nominated projects are required show the potential for a significant positive impact in corrosion control. Innovations can be related to coatings and linings, materials, design,equipment, testing, monitoring, integrity assessment, cathodic protection,chemical treatment, or anything else directly related to corrosion prevention and mitigation. Anyone worldwide involved with corrosion control, including individuals, companies, organizations, and governments, can submit a nomination. There is no fee to enter the program. · “Connectionless Electrical Pulse Response Analysis (CEPRA) Method” — Andrew Fahim, Pouria Ghods, Aali Alizadeh, Sarah Decarufel, Mustafa Salehi; Giatec Scientific Inc.
· “Hexcorder Pro CIPS/DCVG/GPS Survey Instrument” —Elizabeth Nicholson, Pat Yaremko, Matt Bechberger, Peter Nicholson; Cathodic Technology Ltd.
· “Self-Healing Additives for Corrosion Resistance”— Gerald O. Wilson, A.G. Navarro, Subramanyam Kasisomayajula, Christopher R. D.Dayton, H. Magnus Andersson, Gordon Fischer; Autonomic Materials, Inc. In addition to trophies, winners will be featured editorially in 2019 via both the print and digital platforms of MP. They will also be given opportunities to speak about their winning innovation at CORROSION 2020 in Houston, Texas, USA. The next edition of the MP Corrosion Innovation of the Year Awards program will be held at CORROSION 2021 in Salt Lake City, Utah, USA, with the nominating period beginning the prior year in 2020. For more information on the program, visit mp-innovation-awards.webflow.io. At a special CORROSION 2019 ceremony, CoatingsPro Magazine recognized industry excellence in the application of commercial and industrial high-performance coatings with its third annual Contractor Awards Program. Even the foremost corrosion control experts of today had to start somewhere in learning about their chosen field. With that in mind, the NACE Foundation hosted a mini-camp for high school students in the Nashville,Tennessee area to increase their knowledge and awareness of corrosion-based topics. When it comes to protecting the public from liquid/gas pipeline failures—particularly those of a potentially catastrophic nature—NACE members play a vital role. To that end,CORROSION 2019 hosted a forum in which industry experts, including the associate administrator of the Pipeline and Hazardous Materials Safety Administration (PHMSA), addressed the issue of corrosion in pipeline safety.